Tom Barlow and the guys over at WalletPop had a great article the other day about why we have all missed the boat with respect to finding a great deal on a new or used car from a struggling automobile maker. Now, don’t get me wrong. There are still good deals out there waiting to be found, but if you are expecting to get a new car from General Motors, Chrysler, or any other car maker now for a steal, you will be sorely disappointed. Below is a classic finance graph of the supply and demand curves. For the non-finance majors in the room, let me break it down for you. 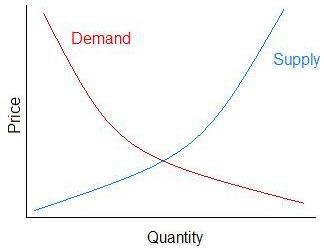 The two curves, supply and demand, always intersect at some price and quantity. When prices are high, supply is low and demand is high. When quantities of a product are abundant, prices starte to decrease to increase demand. The point where the supply and demand lines of a product intersect is said to be the equilibrium price. It is the price where there are no shortages in products with people waiting to purchase them and where there are no excesses in products waiting to be sold either. With respect to cars, the more customers that are in the showrooms, the less likelihood you’ll find a good deal. Edmunds, the car pricing service, has found that Chrysler customers’ intention to buy one of the company’s vehicles was up a 72% in April. The average sale price of a Chrysler has risen 7.8%, from $24,489 just three months ago, to $26,390, only 18% below sticker. Demand for cars is rising (the demand curve is shifting to the right), and subsequently the price of cars is rising again to match that increase in demand. This is great for the economy, but it is bad for those of us looking for real bargains out there. The economist Alfred Marshall said that supply and demand were like the two blades of a pair of scissors in that it is impossible to determine which blade does the actual cutting. The same is true for supply and demand. It is impossible to determine which is responsible for the price of an item. Price is determined by both sides of the equation. While the recent surplus of car inventories during the current recession has driven down automobile prices, it has also driven huge numbers of bargain hunters out to the car lots in the hopes of scoring the deal of a lifetime. The rise in car shoppers recently have helped to drive the prices of cars back up slightly while the economy is showing signs of starting to recover. It’s a crazy car buying world out there right night. Good luck…. I think with the closing of dealerships we will still see some great deals. It doesn’t mean you will automatically get a good deal, but if you negotiate well the deals are there to be had.